One-sentence summary: Peace Corps Regional Meeting in sister-region capital Huancayo, Junín; the seven stages of Grief for not acquiring personal Internet (miFi); regional volunteers “Got the club going up on a Tuesday”; the pure bliss of having an AirBnb and feeling like a grown-up again; How to Lose Confianza in Ten Days; Perú futbol loses to France, exits World Cup, and the country weeps; building work plans in a Land of Ambiguities; and HEY GUYS I now have a mailing address. This week in one sentence: I just simply have no idea what I am doing. Monday – Wednesday: One week after arriving to our sites we had our first Peace Corps regional meeting. For the “Punín” (Pasco/Junín) crew we met in Huancayo, the capital of Junín, roughly six hours midway back to Lima. 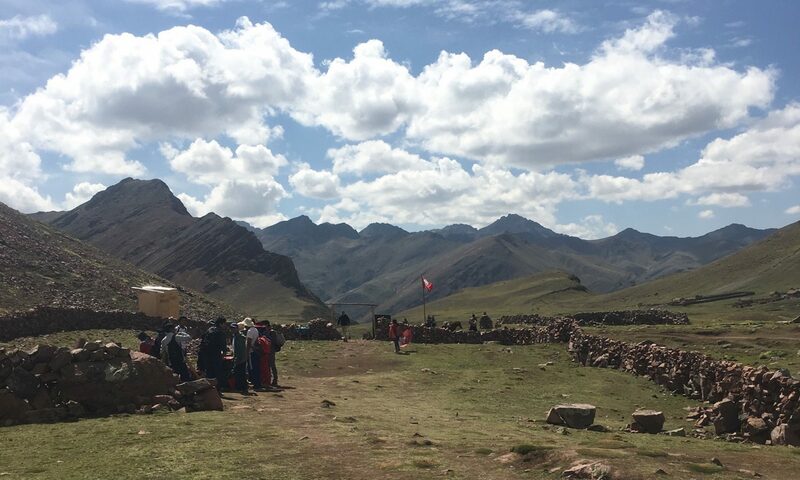 After the installation of us twelve newbie Peru 31 volunteers, there are mas o menos 30 active volunteers in our region. If I learned anything from waiting on the gromoeba (aka “group-think,” “gringo ameoba”, “group amoeba”) it is to take care of my needs first. I know. Why not go ahead and take up Japanese calligraphy with my left foot? Don’t worry- I am putting that as a “secondary project” in my 90-day plan. Back to hanging my laptop out of my second floor Oxa bedroom window, I booked a 3BR apartment in Huancayo on AirBnb with the following winning three amenities: hot water, Internet, and Netflix. A handful of texts later, I had an improv slumber party scheduled where our mutual agenda included grocery shopping, cooking, card games, cakeballs, whiskey cream, kitchen dancing videos, and hot showers. Tuesday morning, all of Peru 31 attended the regional meeting like good, shiny green Freshmen. There was also a decent showing of the Peru 27 “seniors” for a welcome and fare-the-well-we-OOUuuuut. Largely short on attendance were Peru 28 and Peru 30 (the latter just completed a week’s worth of training in Lima @ 6 months) with three showing out of ten. In short: the meeting was two hours too long and could have been emailed in 5 minutes. In long: nothing can replicate the in-person time we had formally and informally connecting with fellow Peace Corps volunteers, one of our most important support systems in-country. I ended up choosing Yay. The downside of having a PC regional meeting at the beginning of the week is having your Monday resurrect with no mercy on a Thursday. (Doesn’t help I stayed up until 5am the night before.) And the confianza you tentatively built like a Jenga game made of marbles rolls out in every direction from your purse, modified desk, and neatly bound & stacked presentation binders. My principal socio (work partner) Edizon has informed me I need to make a work plan. [Insert a finger, emoji, and exclamation point here.] You will include marketing, business plans, finance education, and community banks. Easy. Those are all the words I could gather from Edizon’s rapidly orated paragraph to me in my storage closet 20 minutes before the Peru vs. France game determining the country’s future in the World Cup. If I wait one beat, one night, two days, or one weekend – generally the flavor of my apocalypse changes. Hold out from showing signs of panic, failure, doom and go for a walk – or get a text out of the blue from a fellow volunteer also taking a light and merry jog through existential doubt. Peace Corps seems to have provided me with +/- 729 pages of material stating 1) I am doing just what I am supposed to do and 2) I am right on schedule. While my pseudo-boss (machismo culture) socio rolls into the utility closet like jungle thunder informing me IN JUBILANT SHOUTING FAST SPANISH to built a presentation for 200 producers, Peace Corps says do informal interviews with business owners, spend time with family, and build confianza within the community. Presentations are for Month Seven. To add to the pendulum, Peace Corps also includes a couple binders worth of Must-To-Do Lists and reporting form templates where I am required to introduce myself to the leader of the UGEL, take over the University, teach ten secondary school classes, track finite data meticulously with my science goggles (not provided), write a two-page analysis monthly report (this Friday) categorizing all my progress, prepare a two-page interview for two site visits, spontaneously burst into advanced Spanish fluency, start two community banks, build a swimming pool and start coaching the swimming club I also started, make friends with community children, and somehow have time to casually hang with the family (who after ten days are suddenly my best friends?) after a day at work… in the next 90 days. Or so. Just a suggestion. A required suggestion. Rattled, I sent up the bat signal in the disguise of an emergency taco meeting. There, I was informed by a current 3rd year WASH volunteer that my jazz hands are classic CED: “You probably have bins of markers and papelottes stored under your bed, too.” UMMM. WHAT. NOPE. The next day, from the socio I am not currently avoiding and whom I want to be my friend, also texted me that she’s going to talk to Edizon on Monday and that he can make my work plan and all of us can calm down. So, back to the storm troopers. Just gotta dance it out. Continuing to dominate, from the way I read it! What’s the big concrete wall below the buildings that looks super deep? Is it an arroyo that fills up? Looks high!